Barbecues are Always a Good Idea. 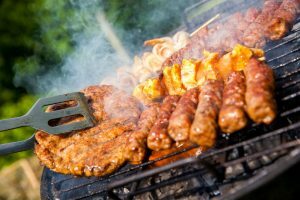 Outdoor barbecues are one of the most enjoyable activities that family members and friends can enjoy together. 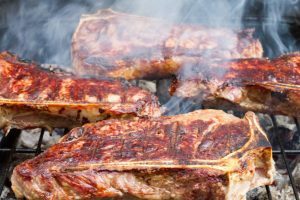 Weekend afternoons can be very engaging and fun from preparing the meat to cooking them outside and concluding with eating the delicious meals. It’s definitely a good thing to look forward to and a wonderful experience for everyone, regardless of age. 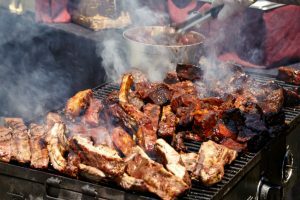 It is perhaps no contest that the star of the barbecue cookout – is the barbecue itself. However, the supporting cast still deserves equal recognition. Among all these, the grill itself arguably deserves the prime spot. Among the outdoor grills available, the Blackstone Griddle Cooking Stations have the spotlight. This grill has a sturdy build for stable support and big enough to hold and cook the food for the entire crew. It also has safety measures built in to protect the cook and the kids who may be playing around. The Blackstone Griddle Cooking Station offers 4 different areas where you can slow-cook different food at their own respective settings. With all these wonderful features, the Blackstone Griddle Cooking Station maybe the only outdoor grill you will ever need. With a cooking area from 720 sq inch, 470 sq inch and 260 sq inch, and burners at 4, 2 and 1, Blackstone certainly has all the variants to match your need. The Blackstone Griddle Cooking Station is not a small grill. It has a cooking surface of 720 square inches sitting on top of a 36” x 20” frame. This grill can easily get a lot of meat smoking and cooking at the same time which means everyone can eat sooner! If space is a constraint then you may opt for the 470 sq inch model or the 260 sq inch portable griddle model. Eating is probably the most enjoyable part of an outdoor barbecue but the Blackstone Griddle Cooking Station can make the cooking experience itself place a close second. 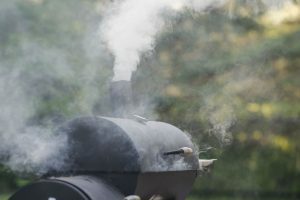 An easy ignition button gets the heat up and roaring and its four differently controlled steel burners can make cooking different meats at different heat settings possible. The cooking capacity of each burner is 15,000 BTU which makes the total capacity of the Blackstone Griddle Cooking Station a whopping 60,000 BTU for the 36in model, 30,000 BTU for the 28in and 12,000 for the 17in model. 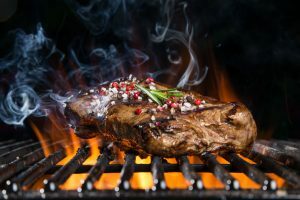 Safety is no joke when it comes to outdoor barbecues as accidents may cause severe burn injuries. The Blackstone Griddle Cooking Stations takes safety seriously and comes with several safety measures, including a stable and easy-to-remove griddle top. The grill itself is made stable with the use of high-grade steel and held together with protective locks. Cleaning the Blackstone Griddle Cooking Station is also a breeze. The grill can be collapsed after each use and the parts can be dismantled quickly for easy washing per piece. No special requirements other than regular household cleaning materials are needed and the grill is ready for use again! The Blackstone Griddle Cooking Stations can be a bit messy to use at times as its grease hole has sometimes proved ineffective spilling the grease that the grill is supposed to collect down. 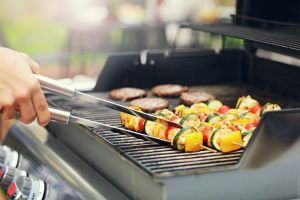 This outdoor grill also has a rather large space between the fire and the cooking pans which may cause problems in windy environments as strong gusts of wind may extinguish the flame. The Blackstone Griddle Cooking Stations are easily the best choice available on the market. A strong and sturdy base gives all the support you need to safely cook the entire prepared menu even at the same time. 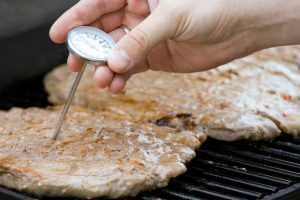 Cleaning up is also made simple, as well as stowing the grill itself. You can be sure that you can bust the grill out more often as outdoor family barbecues can be more enjoyable with this grill. The caster wheels makes it possible to move it easily. In spite of some reported problems encountered while using this grill, its pros definitely outweigh the cons. The grill is what it offers to be – a safe and sturdy outdoor grill that you can reliably use every time you need it. More so, the cons observed can be easily remedied through the use of even the simplest fixes like a small cup. With one company offering you all the sizes and burners as per your need, the sturdy stainless steel frame, easy push igniter button, the fold-up option that makes it easy-to-carry, Blackstone griddle cooking stations are easily the best choice for you. Versus other similar products available, one of the strongest selling points offered by the Blackstone Griddle Cooking Station is its size. It’s rather large 720 square inches of cooking space dwarves other outdoor grills by a large margin. The Char-Broil Classic Gas Grill comes close but, still. it only has a cooking area of 420 square inches. Other products have quite smaller cooking areas as compared to the Blackstone Griddle Cooking Station. The point where Blackstone stations stand out from the rest is the variations that it offers. From 4 burners to a single burner and from a size of 720 sq inch to 260 sq inch, there are options which no other company is offering at such an affordable price. Another solid point that stands out is the cooking capacity of the Blackstone Griddle Cooking Station is its burners. 4 individually controlled burners which can cook at different settings all the same time at a maximum total capacity of 60,000 is no mean feat. It definitely outcooks most other products like the Char-Broil Classic Gas Grill as this one only offers a 40,000 BTU heating capacity over the same number of burners. The Blackstone Griddle Cooking Station is a recommended buy, most especially for outdoor cooking enthusiasts. 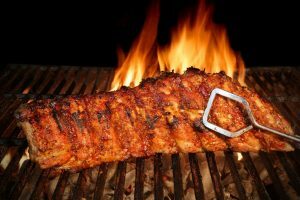 It makes outdoor barbecue sessions a fun and enjoying activity by making the cooking experience itself an easy one. From assembly to cleaning up and the cooking in between, this grill improves the whole experience by a large margin. 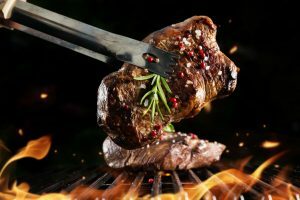 The cool features amps up the enjoyment as you are sure that your barbecue is cooked properly, albeit with less effort from the cook itself. You can be sure that you would be raring to have more outdoor barbecues once you get a hold of this grill. The spacious cooking area with different cooking options afforded by its 4 burners that let you cook different barbecues at the same time will make you want to try more and more recipes conveniently. 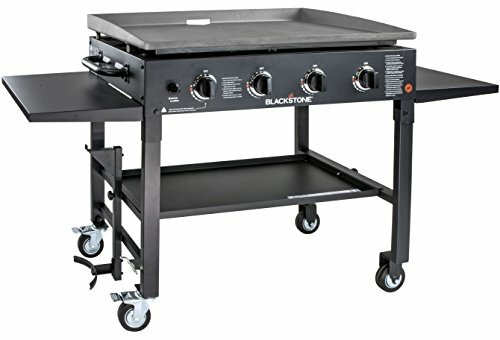 With all the features that come with the Blackstone Propane Gas Griddle Cooking Station, you can never go wrong with getting one, and the guests your outdoor barbecue may even want to get their grill of their own after tasting what this unique grill has to offer. So, you do still get the smiley flavor with the griddle?